HÀ NỘI — Representatives from 21 commercial banks on Tuesday gathered in Hà Nội to discuss the interest rate, affirming that, so far, they are feeling no pressure on the issue. At the meeting, representatives from the country’s four largest banks - Vietcombank, VietinBank, BIDV and Agribank - said they had not increased interest rate till date this year. Lê Đức Thọ, general director of Vietinbank, said deposit and lending interest rates at his bank have remained stable and would continue to be steady in the coming months. 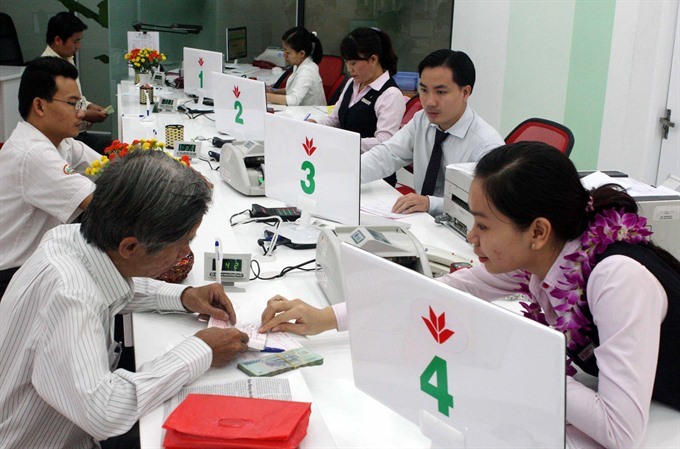 The rate for đồng deposits has remained unchanged since September last year. Phạm Thanh Hà, deputy general director of Vietcombank, said the bank’s ratio of short-term funds for medium- and long-term loans was currently lower than 30 per cent. “We therefore have no pressure to raise medium and long-term capital mobilisation,” Hà said. Representatives from Techcombank, Military Bank, SHB and TPBank also affirmed they had not hiked interest rate in the first quarter and did not for the moment have any plans to raise the rate. Other banks, such as VPBank, HDBank, VIB and Sacombank, which increased the rate in the first quarter, said there was no pressure on liquidity. The hike was part of banks’ standard operation to meet business plans, they said. Phạm Quốc Thanh, deputy general director of HDBank, said his bank in the first quarter inched up interest rate for 6-11 month deposits by 0.2-0.3 percentage points per year against the end of 2016 only to maintain its market share, and not because of liquidity pressure. Meanwhile, VIB deputy general director Ân Thanh Sơn said his bank had increased interest rate for above 12 month deposits by 0.3 percentage points per year in Q1 as VIB belonged to the bank group that usually offered low interest rates. Besides this, he said the hike was to meet VIB’s retail development strategies and follow the central bank’s regulations on reducing the ratio of short-term funds for medium- and long-term loans from 60 per cent to 40 per cent, applicable in 2018. Sơn also affirmed that the bank’s interest rate adjustment was a standard process. Previously, in March, after some banks sharply increased long-term interest rates offered on certificates of deposit to 8.2-9.2 per cent per year, leading to concerns about a rate hike race, SBV made an announcement saying the adjustment was a standard procedure to fit banks’ business strategies. It said some banks could increase interest rates temporarily at this time, and could then lower the rates next time. At the meeting on Tuesday, SBV deputy governor Nguyễn Thị Hồng asserted that the central bank would still pursue its target of keeping interest rates stable and try to cut the rates if possible in the remaining months of the year. The central bank will closely monitor the monetary market to timely support liquidity for commercial banks through open market operations and refinancing, she said. Hồng said the target of interest rate stabilisation would be closely integrated with the recovery of bad debts and restructuring of the banking system.